We’ve heard it before, but the IMF is telling us again: there’s a lot of debt sloshing around in the global economy, and more is on the way. The question before the house: At what point will ballooning deficits reach the financial tipping point? Whatever the answer, we seem to be moving closer to that hazardous peak. That doesn’t mean we’re destined to reach it, but the alarm bells are now ringing loud and clear. A chart from the report summarizes the trend. 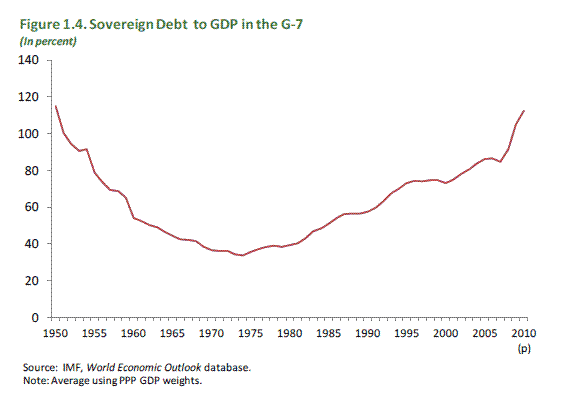 The ratio of sovereign debt to GDP in the G7 countries is approaching 120%, which is near a 60-year high. “Some sovereigns have also been vulnerable to refinancing pressures that could telescope medium-term solvency concerns into short-term funding challenges,” the IMF advises. Sovereign risk has been a topical subject of late, including on these digital pages, such as a look earlier this month at new red ink commentary from the Bank for International Settlements. In broad terms, the IMF essay doesn’t really bring anything new to the table, although it certainly adds a powerful voice to the mounting list of alarms issued from economists and other observers of the macro scene. In another graphic from its report, the IMF contrasts recent trends for several macroeconomic risks. As the chart below shows, the IMF counsels that sovereign credit risk has worsened since last October—in sharp contrast to the otherwise improving state of the macroeconomic environment. The good news is that the “the world economy is recovering from the global crisis better than expected,” the IMF advised in another report, which was published today. That’s no small trend in generating the cash flow needed to pay down the world’s rising debt load. “In its latest World Economic Outlook (WEO), the IMF said among the advanced economies, the United States is off to a better start than Europe and Japan,” according to a statement. “Among emerging and developing economies, emerging Asia is leading the recovery, while many emerging European and some Commonwealth of Independent States economies are lagging behind.” The new WEO projects that world economic growth this year will 4.2%, up from the predicted 3.9% in January. And the U.S. will grow by 3.1% in 2010, up from the 2.7% forecast from earlier this year, according to the IMF. But even amid this encouraging outlook, the statement added that “sovereign risks in advanced economies could undermine financial stability gains and extend the crisis.” The forces of light and dark are headed for battle. “When investing abroad, it’s always important to look at the country’s sovereign rating,” writes Randy Epping in The 21st Century Economy–A Beginner’s Guide. “Usually, a sovereign government is almost always a better credit risk than a company in that country. This is because the government, in theory, will always be the last to go bankrupt.” But perhaps This Time is Different.